Find chapter notes of chapter Theory of equations including important concepts, formulae and some previous year solved questions for WBJEE entrance examination 2018. Aspirants always get 1-2 questions from this topic in the examination. 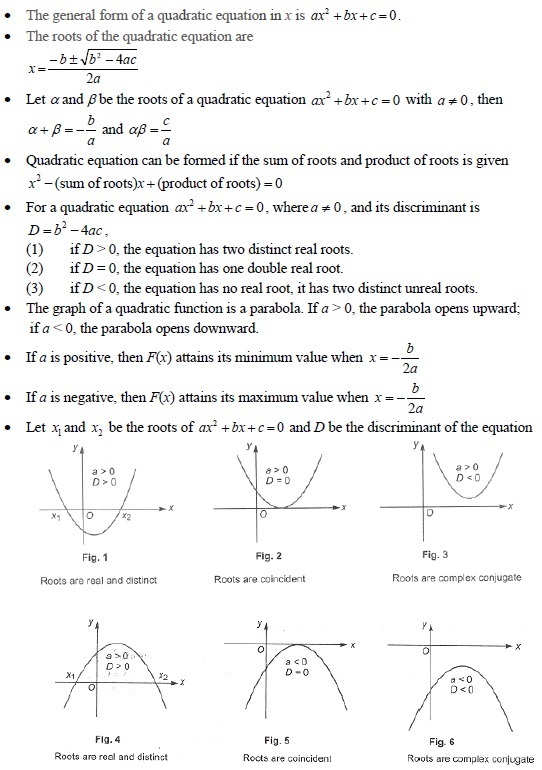 These chapter notes include important topics like general form of quadratic equation, roots of quadratic equation, relation between roots and coefficient of quadratic equation, discriminant of quadratic equation, conditions for nature of roots using discriminant, conditions for minimum and maximum value of parabola, conditions for minimum and maximum value of a parabola etc. So, there is one root γ such that, α < γ < β. Again putting the value of a and b in equation (3) we get the value of c.
So, we have exactly one choice for each of a,b,c. As α and β are the roots of the equation f(x) = x2+bx+c = 0. So, it represents upward parabola which cuts x-axis at α and β. As the graph is symmetric, so, tangent at ((α + β)/2, f((α + β)/2)) parallel to x-axis. Hence the angle between the tangent to the curve at the given point and positive direction of x axis is 0o. Hence, the correct option is (A).